(Phys.org)—A tiny capsule invented at a UCLA lab could go a long way toward improving cancer treatment. "This approach is potentially a new way to treat cancer," said Tang. "It is a difficult problem to deliver the protein if we don't use this vehicle. 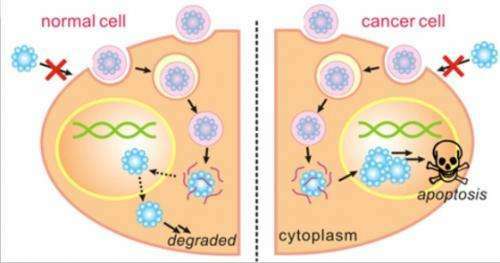 This is a unique way to treat cancer cells and leave healthy cells untouched." "Delivering a large protein complex such as apoptin to the innermost compartment of tumor cells was a challenge, but the reversible polymer encapsulation strategy was very effective in protecting and escorting the cargo in its functional form," said Muxun Zhao, lead author of the research and a graduate student in chemical and biomolecular engineering at UCLA. Tang's group continues to research ways of more precisely targeting tumors, prolonging the circulation time of the capsules and delivering other highly sought-after proteins to cancer cells. Combine this with DRACO, and there would be cures for all cancers and viruses. Just need something universal versus bacteria, although I thought I saw something about that recently too. Has anyone heard anything about DRACO, by the way? I hate to fuel conspiracy theories, but news about it does seem to have vanished.